Sure, the fact that we are celebrating the 20th anniversary of Disney's The Lion King this week might make you feel more than a little old. But truth be told, we have so much to be thankful for! 20 years of Hakuna Matata — that ladies and germs is something to truly treasure, for we have all become better people for it. Though we often think of Rafiki as the wisest beast in all the land, it's actually Pumbaa who taught us the most about the circle of life. Indeed, the hairy and rambunctious warthog wasn't the most delicate creature. But what he lacked in tact, he made up for with heart, and plenty of know-how. This lover of rolling around in the mud is much more than his "everywarthog" appearance would lead you to believe. It seemed like Timon was the brains of their two-mammal operation, but it was Pumba who had the guts. His fearlessness not only helped Simba reclaim his identity and his kingdom (My kingdom for a grub! ), it also gave us a lifetime of lessons in chutzpa. 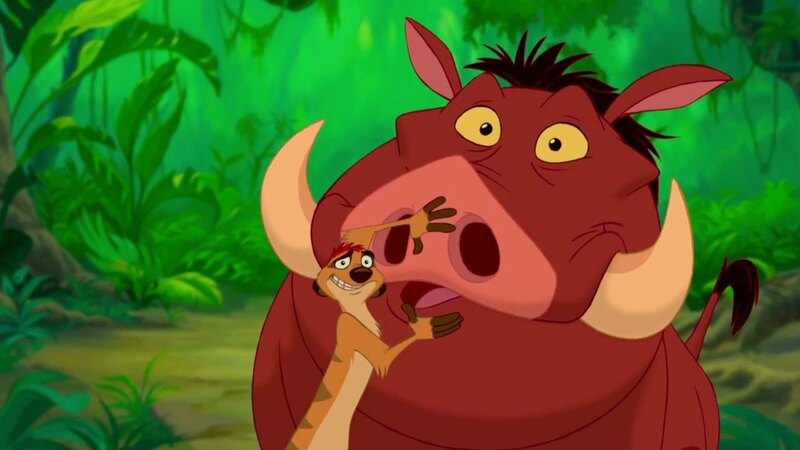 In celebration of one of Disney's finest films, some of its most memorable characters, and by far one of the finest soundtracks your childhood has ever known, here are some of Pumbaa's best words of wisdom. Because 20 years later, you still need them.
" Oh, gee. I always thought they were balls of gas burning billions of miles away." "It's times like this my buddy Timon here says: you got to put your behind in your past. " "Hakuna Matata. It means 'no worries'." "I'm a sensitive soul though I seem thick-skinned." "Home is where your rump rests."